And, according to University of Idaho Professor Juliet Marshall, climate change is increasing the spread of the fungus in Idaho. Marshall said a number of crop diseases have increased their presence in Idaho because of climate change. In warm weather, many bacteria, fungi and viruses simply grow faster, increasing their potential rate of spread. In addition, sick plants decompose faster. Some diseases, never seen before in Idaho, are even starting to pop up in the southern part of the state. Fusarium head blight wasn’t much of a concern in Idaho prior to 2010, Marshall said. The elevation and temperature of the intermountain West wasn’t conducive for the disease, but it began occurring in higher frequencies. The industry has little tolerance for the fusarium head blight toxin in wheat meant for human consumption and zero tolerance for the toxin in barley for malting. Marshall remembers farmers would try to deliver their wheat and barley and be turned away. And the growers couldn’t even sell the grain as animal feed. Even the dairy industry wouldn’t buy the grain for their cows — which can tolerate low levels of the toxin — because of food safety concerns. “I’ve seen insurance company reps come and find high levels of the disease in a field and say, ‘Chop it and plow it down. Don’t harvest,’” Marshall said. For the past four years, Marshall has developed a nursery at U of I’s Aberdeen Research and Extension Center that tests for plant resilience against head blight. Her team tries to infect different varieties of wheat and barley and analyze the amount of toxin that accumulates in the grain of any infected plants. Marshall thinks the disease is becoming harder to control as temperatures increase with climate change. The fungus can live on corn residues, and Idaho is producing more and more corn as the region warms. The fungus can easily transfer from the corn to wheat and barley fields through airborne spores. Wheat appears to be more susceptible to the fungus than barley, and the amount of harvested grain testing positive has increased over the past five years. CALS Research Professor Juliet Marshall studies a wheat field. Marshall oversees U of I Extension variety trials, where her team studies how environmental factors like temperature, precipitation and soil type affect the quality of grain produced by U of I, private industry and other universities’ new varieties. When the climate shifts, these tests become more difficult. 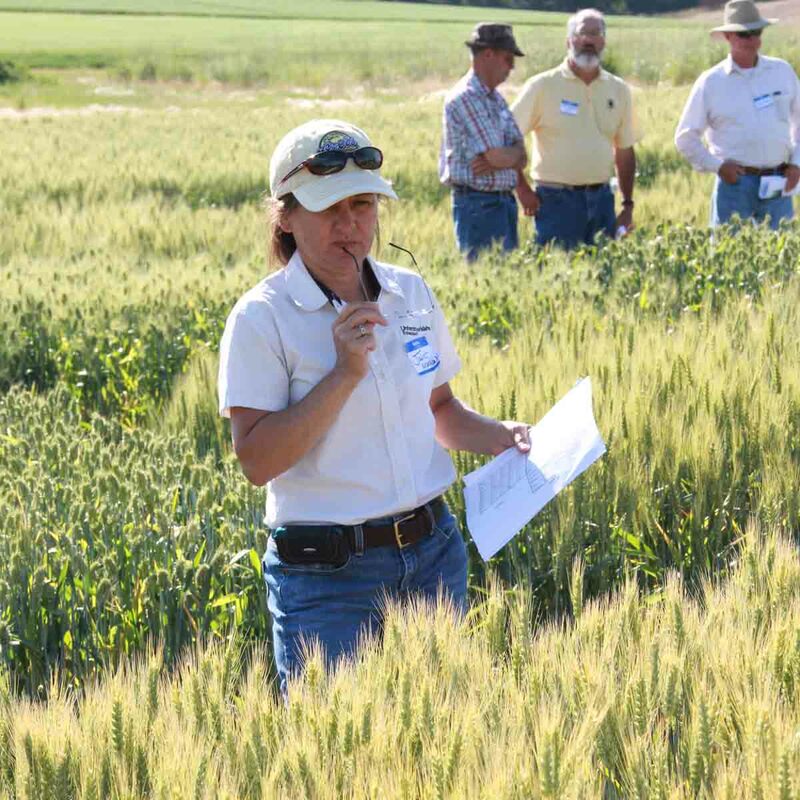 An associate professor at the Aberdeen Research and Extension Center, Chen is breeding wheat resistant to a number of pests and diseases that are becoming more problematic with climate change. As part of the trials and her work with growers, Marshall has come across a number of plant diseases benefiting from warmer temperatures. Fungal disease stripe rust and the bacterial disease called Xanthomonas black chaff — or bacterial streak — both of which damage the leaves of wheat and barley. Marshall said the stripe rust fungus has adapted itself to warmer temperatures, creating a longer timeline each year for disease spread. In addition, warmer winters may allow the fungus to survive through the winter, increasing the disease pressure early in the growing season. Bacteria grow more rapidly in warmer temperatures, and black chaff infections have intensified as a result. Barley yellow dwarf virus has also caught Marshall’s attention. The virus lives in the gut of an aphid that particularly enjoys corn. As corn production in Idaho increases, more of these aphids and their hitchhiking viruses make their way into Idaho’s wheat and barley fields. In the past, cold winters and frost events killed many of the aphids, stalling the virus’s spread in spring. But, as climate change delivers less harsh winters, more aphids survive into spring. Wheat and barley in Idaho have always had problems with the cereal cyst nematode, a type of roundworm that damages the grains’ roots. If growers can remove the nematodes’ food source — wheat, barley and oat — for a little while, the population will drop. If farmers don’t practice proper crop rotation, their fields are susceptible to a buildup of cereal nematodes, a problem that often goes unnoticed by farmers, said Pooria Ensafi, a doctoral student working with Marshall on nematodes. As part of his graduate work, Ensafi helped identify wheat and barley varieties that have higher degrees of resistance to the nematode. Unfortunately, some of the most popular varieties of barley for the malt barley industry happen to be susceptible to the cereal cyst nematode, Ensafi said. This project was funded under U.S. Department of Agriculture Agricultural Research Service award 59-0206-4-040. The total project funding is $141,717 of which 100 percent is the federal share. This project was funded under U.S. Department of Agriculture Agricultural Research Service award 58-2050-8-013. The total project funding is $97,570 of which 83.33 percent is the federal share. 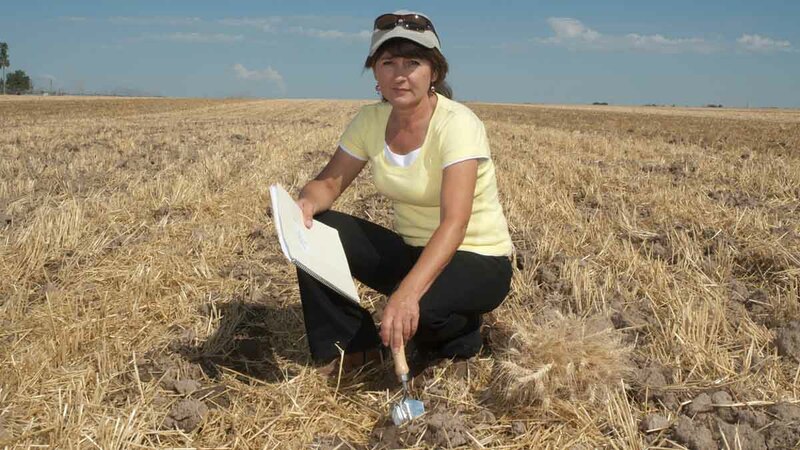 CALS Research Professor Juliet Marshall kneels in a wheat stubble field.